Would you like to order your pet supplies online? We now have a wide assortment of pet supplies available in our web shops. 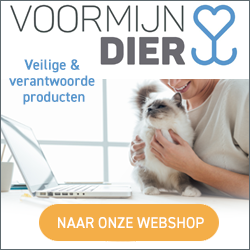 Voor mijn dier is a partnership of more than 250 veterinarians. It is an online pet store with an assortment of more than 10.000 products. Because this is a partnership between multiple veterinarian practices, we have no influence on the online assortment. The vetpetshop offers a wide assortment of pet products. It also offers medical pet foods that are exclusively available to veterinarian practices. The Vetpetshop offers home delivery and delivery at our practice where you can pick up your order during our opening hours. Because the vetpetshop is our own web shop the assortment only consist of products we recommend.